Qlik Tips: Where are the Irish going? Another poor pie chart. Where are the Irish going? Another poor pie chart. Oh dear. Yet another poor example of a pie (in fact a doughnut) chart to try and get across something that is very important to Irish people. David McWilliams is a leading Irish economist. One of the few to predict trouble many years before the crash, mostly not listened to. I think that he has a wonderful grasp of world economics and how they apply and interlink with Irish economics. 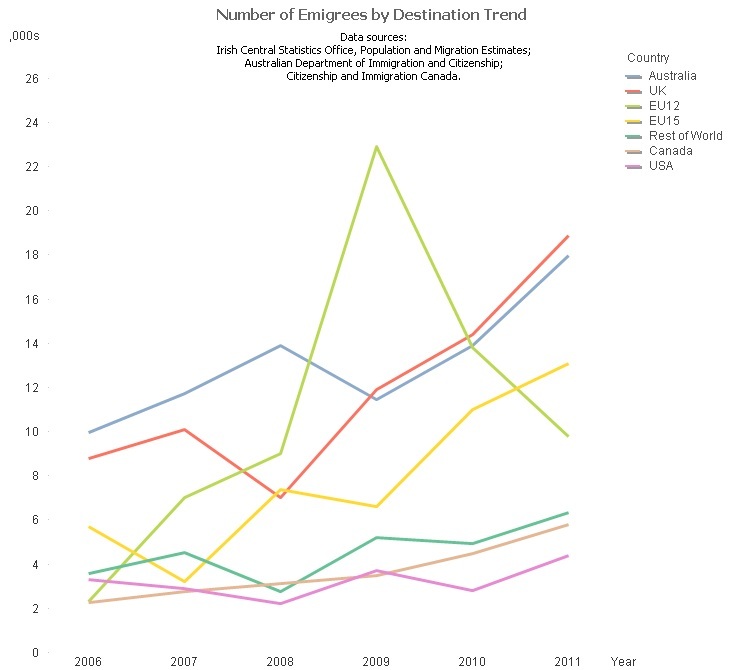 Unfortunately, when he described the chart below as a "wonderful graphic on Irish emigration", he showed that, like many, he doesn't know much about the presentation of quantative data. It is an "interactive" doughnut chart where each segment represents the number of people going to different locations around the world. Besides all the usual issues with pie type charts (my blog post on "Defending Pie Charts" might be a good place to start reading about the problem with pies; and of course, Stephen Few's Save the Pies for Dessert), the whole interactive thing makes it even more difficult to grasp the numbers and the relationship between them. From this chart, it is quite easy now to see that there is a general trend upwards in emigration and the UK and Australia are the main destinations. There is a huge spike in EU12 (the 12 countries that have joined the EU since 2004) during 2009. I had my suspicions of what that was so I went to the Irish Central Statistics Office website and retrieved the figures for emigration by nationality. This confirmed what my suspicions were - many of the eastern Europeans (Polish, Lithuanian, Latvian, etc.) who had emigrated into Ireland during the Celtic Tiger years, many of whom worked in the construction industry, left in 2009 because of the collapse of that industry. "Fancy" charts often actually hide the numbers that people want to see. Here we have two very plain and simple line charts that tell much more of a story. It is not a great story if you are Irish. That's a great example of someone choosing bells and whistles at the expense of usable information. Thanks! What are the colour of your eyes?